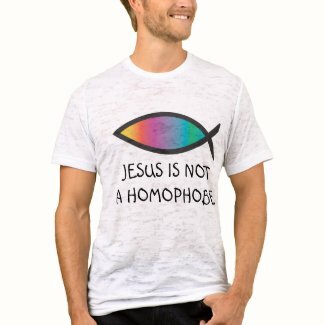 A gay teen in a T-shirt that says, “Jesus is not a homophobe” is among those taking a stand for LGBT youth today on the Day of Silence. Today is the Day of Silence, a national student-led protest of anti-LGBT bullying in schools. On April 20 students from middle school through college take a vow of silence to emphasize the silencing effect of anti-LGBT harassment. During their silence, students explain their message with printed cards, buttons, stickers, T-shirts and such. 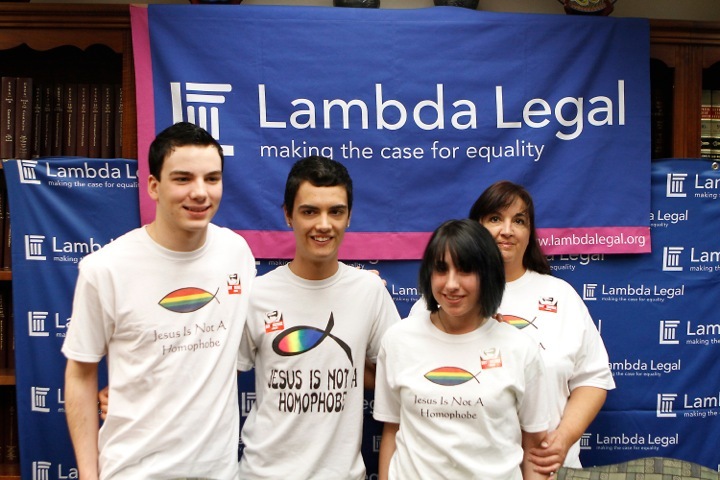 On April 3 Lambda Legal filed suit against the Wayne Local School District on Maverick’s behalf, arguing that they violated Couch’s First Amendment right to free speech. The very next day a federal judge ruled that Couch can wear his T-shirt while the case proceeds -- but only on the Day of Silence. Couch’s experience shows the power of combining LGBT and Christian messages. 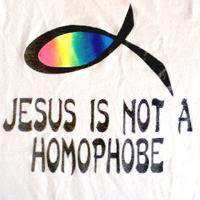 I have done so many projects about the queer Christ that it almost seems tame to wear a T-shirt saying “Jesus is not a homophobe.” But it sure made an impact! The Day of Silence feels like great progress to me when I remember my own high school years in the 1970s. Back then every day was a type of “day of silence” in which we queer kids were afraid to identify ourselves. 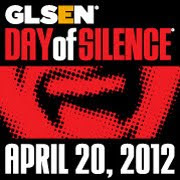 Founded in 1996, the Day of Silence is sponsored by the Gay, Lesbian and Straight Education Network (GLSEN). The first Day of Silence was organized at the University of Virginia in response to a class assignment on non-violent protest. More than 8,000 schools have participated in the event, which is held every year in April. Maverick's the man! What a fabulous name to have - and good for him for standing his ground - proving that America can be the land of the free when it tries. Yes, Maverick is definitely living up to his name. Lambda Legal is running a signature campaign now for his lawsuit called “Be a Real Maverick: Stand Up for Equality.” I speak as someone who also has an unusual name. “Kittredge” has been handed down through the women in my family.